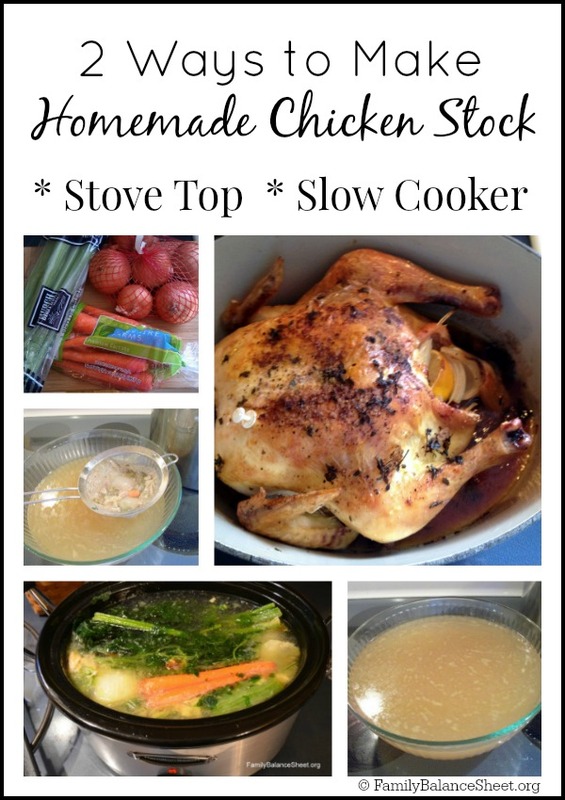 Wondering how to make chicken stock? I’ve been making my own stock for years. It’s so easy! If I can do it, you can make homemade chicken stock too! I credit Ina Garten for teaching me how to cook. She showed me how simple roasting a chicken was in my early days of home cooking and making my own stock was a natural accompaniment. You see, I didn’t start cooking until I became a stay at home mother at the ripe age of 36. Prior to motherhood, we sustained on take out and cereal…seriously, I could eat cereal 3 meals a day and before I had kids, that exactly what I did. I’ve come really far since those early days of motherhood–you have no idea. —>>Back to chicken stock…Making your own chicken stock is a great way to stretch your grocery dollar, especially if you are inclined to buy organic chicken, which can be twice the price of non-organic. I have made my own chicken stock two ways: Stove Top and Slow Cooker. Either way is fine and the end result is the same—rich, flavorful stock. 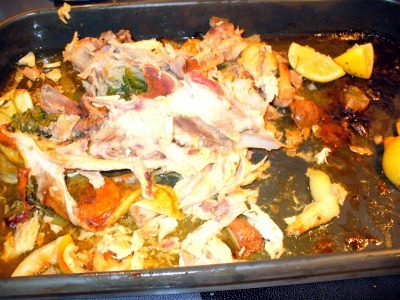 After you’ve roasted a chicken, make a delicious stock with the leftover bones. 1. Place all of the ingredients in a large stock pot and cover with water about 2 inches above the ingredients. 2. Bring to a boil, then reduce to a simmer, uncovered, for about 2 – 3 hours. You could simmer even longer if you have more time. 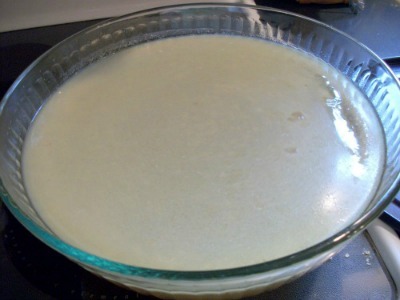 Stirring occasionally and skimming off any foam that might form and rise to the top. 3. Allow to cool. Carefully, spoon or pour the stock, veggies, herbs through a sieve into a big bowl. Press juices out of veggies and herbs. Discard bones, veggies, herbs. Stir well and allow to cool down completely. Remove any fat that rises to the top. 5. Stock can be used immediately, or once stock has cooled completely, place in the refrigerator overnight. 6. The next day, skim any fat that has risen to the surface. Stir well and place in freezer containers. The stock should last about one week in the refrigerator and 3 months in the freezer. 7. 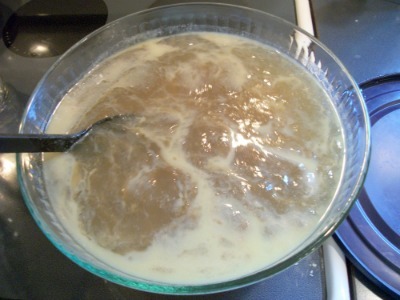 The stock can get very gelatinous and thick and that is a good thing. Do not be alarmed, this equals flavor. 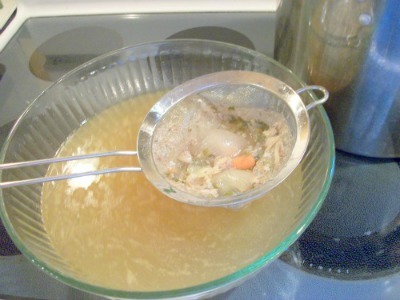 When you cook the stock in your soup or dish, it will thin out. I use containers of different sizes: 32 oz, 16 oz and 1 cup. As a side note, you could also cook a whole chicken this way, instead of roasting. In a large stock pot, cook the same ingredients as above except use a whole chicken. I prefer eating roasted chicken, but this is a good alternative during warmer weather when you don’t want to turn on the oven. Since I usually roast a chicken in the afternoon or evening, this method works really well. 1. Place the same ingredients as above in your slow cooker and fill with water. Cook on LOW overnight. 2. The next morning you will walk into your kitchen with the comforting aroma of chicken soup. 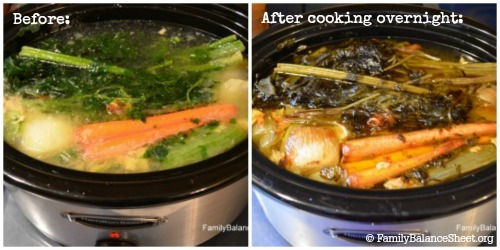 Turn the slow cooker off and allow the stock to cool slightly. 3. Strain the stock through a sieve and press the ingredients down with a spoon to get as much flavor to pass through the sieve. The stock can be used immediately or cooled completely and stored the refrigerator until the next day. 4. On the following day, skim any fat off and put into freezer containers to store in the freezer for future use. Making your own chicken stock is very easy and really stretches your grocery dollar. Look for sales on roasting chickens and figure out your “buy” price. In my area, .79/lb is a good price. Find a recipe for roasting chicken that you like because those flavors will carry into your stock. There are tons of stock recipes online, but I use simple vegetables that usually can be found on sale and in my refrigerator. 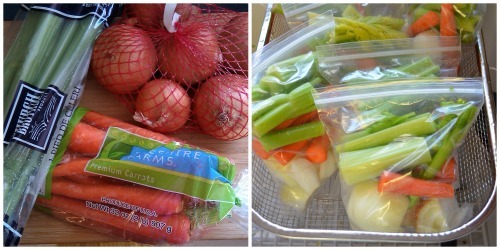 And speaking of vegetables, when I find a really good sale on onions, carrots, and celery at the same time, I make stock bags to keep in the freezer, so I’m always ready to make stock. Picture below. I didn’t start making chicken stock until I was 50! I always assumed it would be too much of a hassle. Until I read a post on this blog from Oct. 2009!! I am across it in early 2010, printed it off and have been doing crockpot stock ever since! This summer I even took the plunge and started pressure canning it instead of freezing it. Just goes to show that it’s never too late to learn! Btw, I found your blog again after Stacy from Stacy Makes Cents posted a link on Facebook to her “interview” here. too funny! I’m so glad you commented–made my day. I love Stacy. She’s so witty and I loved reading her debt free story. Kelly, you made my day! I’m so glad you found me again and commented. I was referring to that 2009 post myself recently when I was making some stock and decided it was time to update the recipe. I’ve never taken the plunge into pressure canning, but it makes so much sense. No threat of losing everything in the freezer from a power outage–yikes!! I’ll have to look into it. We had a whole chicken tonight and my broth is cooking on low in the slow cooker as I type this. Cooking it overnight is my favorite method! In a way, I’m glad cereal is so expensive, because I don’t eat all the time anymore. I’ve tried making chicken stock before and it’s never turned out well. I feel stupid for now knowing that I need all those veggies in there. Now that I read this, it makes sense! Thanks! You’re welcome! Let us know how it turns out.